Dirrans End is an 80 hectare property directly adjoining the Herberton Range National Park section of the Wet Tropics World Heritage Area. The property consists of 40 hectares of world heritage quality rainforest with the remainder being pasture. South Endeavour purchased Dirrans End in early 2014 for the specific purpose of securing the completion of the State and Nationally significant Rock Road Wildlife Corridor. The Rock Road Wildlife Corridor is one of the most ambitious rainforest restoration projects on the Atherton Tablelands. It joins the largest rainforest remnant on the Tablelands, the Hypipamee Outlier, to the Wet Tropics World Heritage Area. The Outlier consists of almost 1000 hectares of endangered high altitude rainforest on basalt. This rainforest is home to a remarkable assemblage of mammals, birds and amphibians many of which are endemic to the high altitude rainforests and whose conservation is of national significance. The high altitude rainforest is also prime breeding habitat for Lumholtz's Tree Kangaroo Dendrolagus lumholtzi. South Endeavour's Carabeen Creek reserve is the largest private rainforest holding in the Hypipamee Outlier and it has given us a firsthand appreciation of the need to provide a permanent and meaningful connection to the forests of the Wet Tropics World Heritage Area. Not only will this provide a much larger and more robust connected habitat for these species to survive and thrive, but it is also essential to provide for movement of highly temperature sensitive species such as the Lemuroid Ringtail Possum. This wonderful animal is so sensitive to sustained high temperatures that it could well be the first Australian mammal to be rendered extinct by climate change. hectares is our current priority focus for the property. 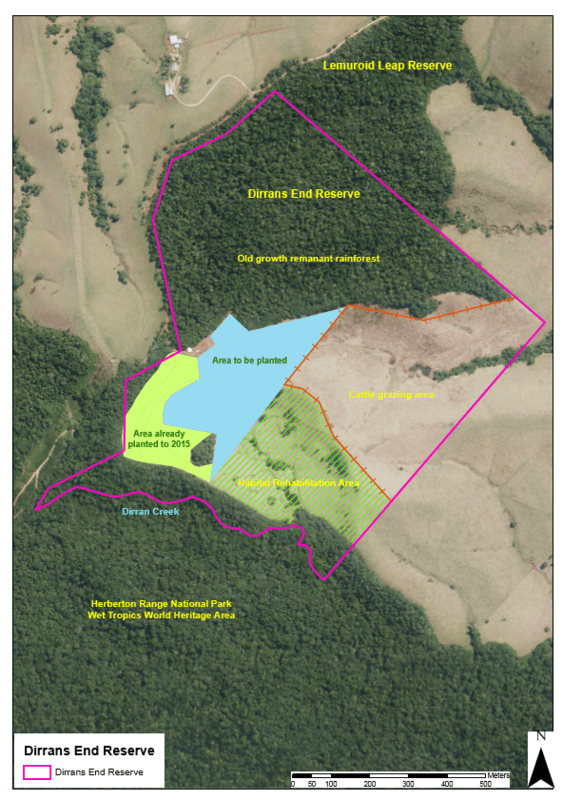 A further 11 hectares of rainforest restoration is planned, but this is to provide a more robust buffer for both the corridor and the World Heritage Area rather than being critical to the corridor itself. 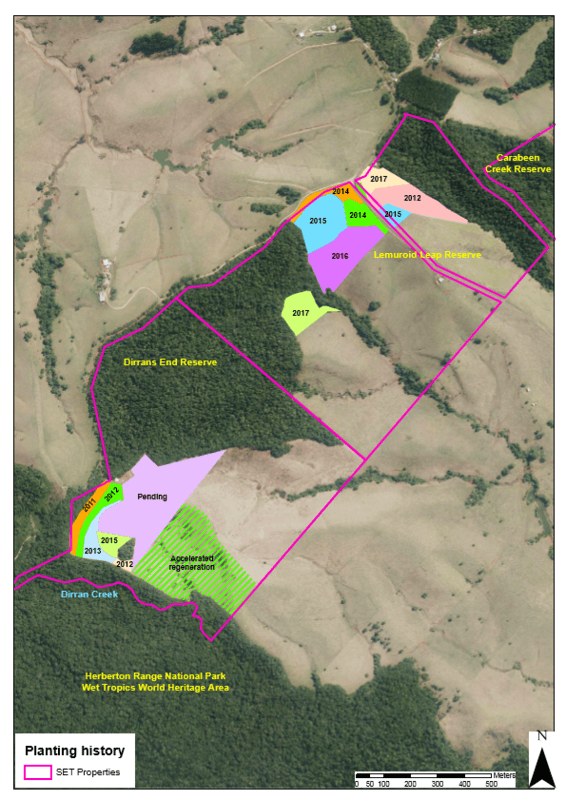 Working with a grand coalition of local partners, to date we have planted out 9 hectares of rainforest in the corridor on our Lemuroid Leap reserve and we will be planting a further 5.2 hectares on this reserve over the 2016 and 2017 wet seasons. This has been a massive and very expensive undertaking, but we are very fortunate to be the beneficiary of the experience that our partners who, over the past 30 years, have built up a wealth of knowledge as to how to quickly and effectively restore Wet Tropics pastureland back to rainforest. Our partners in these projects include: The Wet Tropics Management Authority, the Queensland Department of the Environment, the Tablelands Regional Council, community groups TREAT and the Tree Kangaroo and Mammal Group, and Conservation Volunteers Australia. In addition Ergon Energy donated and erected two poles that will be shortly fitted out with a rope bridge for a short aerial possum crossing of Kenny Road. A recent wildlife survey on Lemuroid Leap found that Lumholtz's Tree Kangaroos and some of the rainforest possums were already utilizing replanted forest only three years old. We are now moving to reafforest the critical 8 hectare area on Dirrans End. Once we have successfully restored rainforest cover to this area we will have a minimum 250 metres width of rainforest for the entire length of the corridor. The revegetation of one hectare of rainforest requires the planting of at least 3,500 trees and at least three years of labour intensive maintenance. The latter includes watering young seedlings during dry spells and herbicide application by skilled operators to suppress competition from introduced pasture grasses. The all up cost of this is around $40,000 per hectare. This means that our priority Dirrans End project will cost in the vicinity of $250,000. South Endeavour is totally committed to completing this project as money and resources allow. We are currently very actively seeking grant funding to assist in this and to speed up the whole project.